Atlanta digital agency unveils new web presence. LBi Atlanta launched its new web presence, http://www.lbiatlanta.com, a three-month project driven by Executive Creative Director Thurston Yates, Creative Director Brad Hanna, Art Director Alex Kurth and Sr. Flash Developer Chris Rebel. The new site offers a captivating combination of thought provoking content and dynamic, multi-modal interface. Designed as a quarterly publication, the site is anchored by a collection of articles around a central theme rooted in modern digital branding issues affecting clients and customers alike. 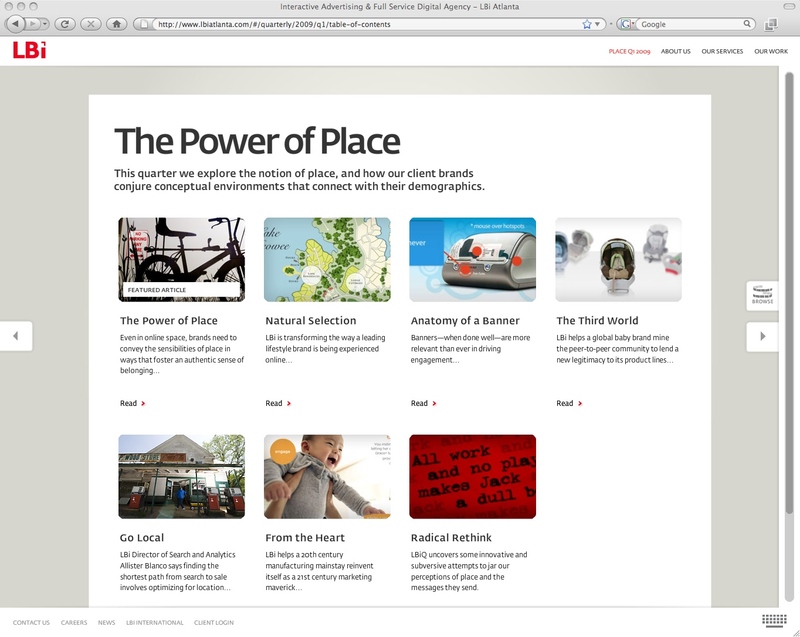 Beginning with "The Power of Place," the inaugural, first quarter publication explores the considerations, challenges and outcomes of helping Brands develop an authentic "sense of place" in the digital environment. Subsequent themes will be chosen based on their relevance to the current digital landscape and importance in evolving the state of digital branding. Prerequisite agency information is also available highlighting the company's heritage, services, and featured clients and projects. "Our goal was to move beyond the typical slate of services and client work and provide clients with greater insight into the issues and considerations we face managing their digital brands," said Yates. "We believe our approach--both strategically and creatively--delivers a greater degree of client service and brand understanding that few firms provide. We hoped to make that evident in our online presence." 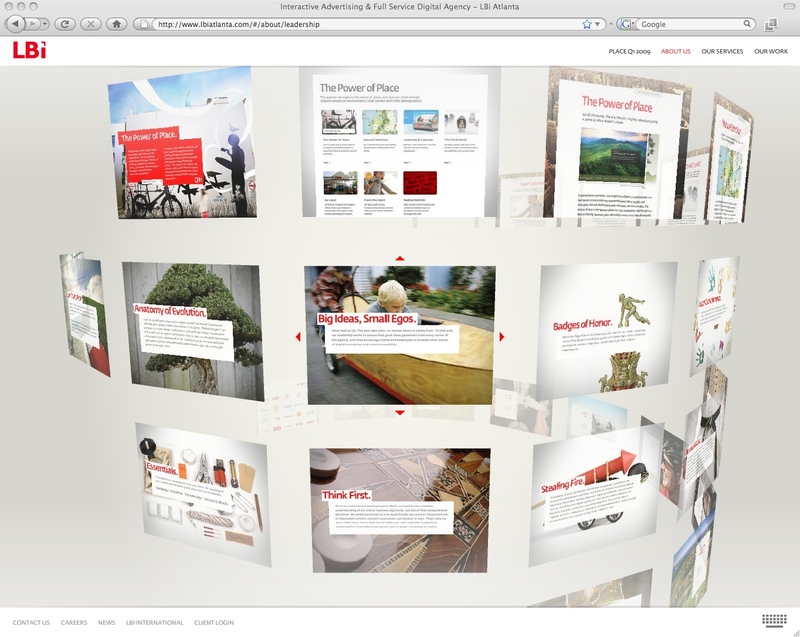 The centerpiece of the site is its unique "browse" capability conceived and developed by Kurth and Rebel -- pages are arrayed dimensionally as a series of graphic rings that rotate freely in a cylindrical stack. Each ring, representing a section in the primary navigation, is composed of a series of each section's pages. Users can spin or navigate through the rings using either a mouse or their keyboard's arrow keys. Clicking on any of the pages in a ring zooms the user into that page, which becomes fully interactive with more traditional navigation elements, and allows one to click laterally through the full-scale pages of the ring. A mini representation of the ring cylinder is always available for users wishing to return to the "browse" perspective. "We hoped to create something both elegant and exciting without sacrificing anything in the user experience," said Hanna. "The site nicely balances a very modern, aesthetically-driven navigation system with one that functions more traditionally. The interplay between the two is fluid and uncomplicated." LBi Atlanta is a full service global marketing and technology agency and a member of LBi International AB's worldwide portfolio of interactive agencies, providing award-winning strategy, creative, and technology solutions for leading brands around the world. Learn more at http://www.lbiatlanta.com.